Yotam Ottolenghi (right) and Sami Tamimi. Bagel bakeries and salt-beef delis have long been part of London’s ethnic food scene. But it’s the comfort food of the Southeast Asian diaspora: Indian, Bangladeshi and Pakistani, that has turned out a national dish (Chicken Tikka Masala) and trained the British palate to appreciate flavors far more complex than meat pies and fish and chips. These days, however, it is the slow, steady influence of Israeli cuisine subtly transforming London’s culinary landscape with food that’s nothing like your grandmother’s pastrami on rye. Hungry Londoners are shifting their gaze away from complicated dishes and white tablecloths to the East, where casual, simple food with few ingredients dominates. Londoners are now smitten with flavors from the Promised Land. It began with Israeli chef Yotam Ottolenghi back in 2002; the glass cases of his gourmet delis stocked with colorful salads and unusual pairings helped make vegetables more than a side dish. Ottolenghi and his Palestinian business partner Sami Tamimi fuse flavors from Israel’s melting pot of immigrants: East European, the Levantine, the Maghreb, Yemenis, Kurdistanis, the Druze and Palestinian populations to create dishes that mirror the country’s diverse population. The result? Simple and successful combinations like roasted butternut squash with cardamom yogurt and pumpkin seeds. Ottolenghi, 46, hosts TV specials, pens a weekly column for The Guardian and has written four cookbooks, most recently Plenty More: Vibrant Vegetable Cooking from London’s Ottolenghi (Ten Speed Press). 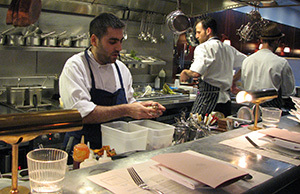 Five years ago, he opened NOPI, a restaurant near London’s busy Regent Street shopping area. With its clean, white marble walls and brass lamps, the atmosphere and menu transport diners to the Middle East. Its enormous popularity has made Ottolenghi a victim of the greatest form of flattery. Some of London’s newest and most talked about restaurants are imitating his style of small dishes, lots of veg and light, healthy-ish concoctions. Think smoked eggplant with a dollop of thick yogurt topped with pomegranate seeds. Yogurt always makes an appearance. It’s true. When I first moved to London more than 10 years ago I brought over suitcases full of black beans from the United States. Over the last six years or so, they’ve become available at local supermarkets. Ottolenghi has helped put ingredients like pomegranate seeds and date molasses on store shelves and in home kitchens. Sarit Packer (left) and Itamar Srulovich inside Honey & Co.
Making once obscure items more mainstream is just one aspect. The movement is about more than food. Just as important is the relaxed, informal restaurant environment and an emphasis on genuine, warm service (none of Ottolenghi’s restaurants or delis is kosher). 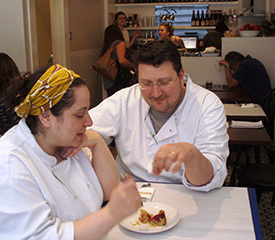 Israeli couple Sarit Packer, 38, and Itamar Srulovich, 36, spent five years working with Ottolenghi before opening their own small restaurant in 2012. Honey & Co, which is not kosher, has caused such a stir, there was a bidding war for the rights to the couple’s first cookbook Honey & Co.: The Cookbook . What makes Honey & Co. so beloved among its customers is the lack of pretension and it’s homey feel. Comfortable but refreshingly different, like their vegetarian shawarma. Typically either turkey or lamb slow-roasted on a stake, theirs features spice-roasted cauliflower with tahini, caramelized onion and crispy pita. Even more adventurous are their savory cheesecakes, made with eggplant; roasted zucchini and mint; or roasted peppers, Kalamata olives and oregano. With just 10 tables, it’s definitely an intimate experience, and contrary to the buttoned-up, detached service style of the Brits. 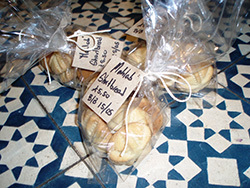 Mahlab shortbread at Honey & Co.
That intangible part runs through the bloodline of Israeli chefs—or at least the few who have set up shop in London. Whatever it is, Gill fell just as hard for another recently opened Israeli restaurant. “It all comes with such gasps of hospitality it’s impossible not to feel well-fed and wanted…” Gill wrote in 2014 of The Palomar, before giving the chef and his team the ultimate compliment: “If you were going to get stood up on a date, this is definitely the place you’d want to get stood up.” Before he left, the critic gave chef Tomer Amedi a hug. Gill’s effusiveness could be why it’s been hard to get a table since The Palomar opened in May 2014. Behind it are the partners of one of Jerusalem’s most popular restaurants, Machneyuda, with Amedi, 31, as head chef. Cooking is in Amedi’s Kurdish-Moroccan DNA. His father is a passionate cook and, on a recent visit to London, joined Amedi in The Palomar’s kitchen. The chef grew up with his mother’s Moroccan dishes and his Kurdish grandmother’s special Sabbath stew, which cooks over 24 hours. A typical Kurdish dish, it’s long on labor and short on ingredients. Amedi blends the simple flavors of Kurdish cooking with the richer ones of Moroccan cuisine. One of the most popular plates at The Palomar is the pork belly, a dish created especially for the nonkosher British palate and one that represents Amedi’s familial influence. Tomer Amedi in The Palomar’s kitchen. Amedi says Israeli-style meals with more vegetables and less protein is part of the appeal for Brits more accustomed to heavier food. What seems a revelation in the United Kingdom, he says, is fairly basic in Israel. The current craving for healthy, exciting new flavors is here to stay, Ottolenghi says. Amy Guttman is a multimedia journalist based in London. She has written for CBS News, The Atlantic, NPR, BBC, Forbes and others.